This interview is our last in line for the Fall 2007 Essay Contest, and today we get to chat with Stephanie Haefner, who has won several of our contests! It’s always nice to have her back and see what she’s up to. Stephanie Haefner is a novelist of women's fiction and chick lit, currently working on her third novel and at least a dozen other short works and essays! She has taken top 10 and top 25 honors in fiction contests in the past and continues to learn and grow in her writing. Stephanie is the mother of one energetic and outgoing almost 5 year-old girl with another little one on the way. She is also the daughter of an amazing and caring woman, the inspiration for her essay. She is shown in the photo with her, a shot taken during their fabulous Mother/Daughter vacation earlier this year! We congratulate Stephanie for her award winning entry in the Fall 2007 Essay Contest, sponsored by the Globe Pequot Press’ skirt! books. If you haven't done so already, please read Stephanie's award winning story, A Quest For Answers. Then come back and join us as we chat with Stephanie, a multi-talented writer who has won both our flash fiction and nonfiction contests! Stephanie: I think sometimes it's easy for people to give love so freely to those with the same blood running through them. It's uncomplicated...they're your family, you must love them, right? I think it takes a truly special person to love unconditionally when there is no "must" to it. WOW: That was one of things that was so touching about your essay. In fact, before your stepmother became your mom, she held you when you were only a few months old at a party your birth mother brought you to. You said a connection was made between you that day, and I’m certain it was. Have you ever asked her if she felt a connection, or somehow knew what the future held? Stephanie: No, I haven't. But I did give her a copy of the story to read after I submitted it to you. She hugged me quite tightly with tears in her eyes and told me she loved me. I think that says it all! WOW: Aw... I even got teary-eyed when reading your story. And I love the picture you shared with us of you and your mom at Disneyland. What was the highlight of your Mother/Daughter vacation? 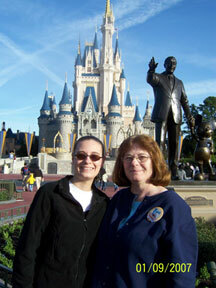 Stephanie: This trip to Disney was a first for my mom, a third time for me. The highlight for me was showing her a place that is so magical; the looks in her eyes almost the same as taking a child for the first time—unadulterated joy and happiness. WOW: Stephanie, I hope you don’t mind me asking, but have you ever gotten in touch with your birth mother, or do you have any desire to? Stephanie: After she left, I did have a relationship with her, one that gave us little time together. I saw her in the summer for a short time each year. It wasn't a real mother-daughter relationship though. When I talk about it, I describe it as a dream. It was fun and free, but not reality at all. It never gave me the stability that I had with my stepmom. WOW: Okay, switching gears a bit. Stephanie, you are an excellent writer. You’ve won several of our contests now, but since this was our only nonfiction contest, was this one harder to write than the others? Stephanie: Usually nonfiction work is not my strongest, but when it's something I'm passionate about, it flows quite freely from my fingertips. WOW: So you prefer fiction over nonfiction? Stephanie: I do prefer fiction...I love the places my imagination can take me! It's my creation and I can take it anywhere I want...the facts don't stand in my way! WOW: I hear ya! I’m a fiction fanatic myself. So, what are you working on right now? Stephanie: I am working on a third novel, a women’s lit/chick lit type of story. I love to write stories that make the reader laugh a little, cry a little, and even be a bit angry too!! I like to take readers through every emotion! WOW: Three novels...wow! And your stories are so creative. Have you entered any other writing contests that you would recommend to our writers/readers? Stephanie: I have entered pieces in a few other flash fiction contests but I don't think my style quite fit! WOW: I find that surprising! Well, you’re always welcome at ours. Thank you Stephanie for always being such an inspiration to us, and congratulations once again on winning another WOW! contest! I always love reading your pieces. Do you have any inspirational quotes or words of encouragement to share with our writers/readers? Stephanie: Thank you so much!! My biggest advice to other writers is to get out there and submit, submit, submit! And find a good writers group! I have a wonderful group of amazingly talented writers I meet with. They are my cheerleading squad and I am theirs too! And remember, we’ll be getting ready for our Winter 2008 Contest Winner Interviews. So, be sure to check back later after the April issue goes live for the latest interviews.